The February edition of Emergency Medicine Australasia (2012) 24, 23-30 has a case series of surgical cricothyrotomies. 24 cases are described by two operators(anaesthetists) over 19 years. In the Advanced Airway workshop, I teach a different approach, but lets see what was written and then discuss. Stabilize the larynx with non-dominant hand. Identify cricothyroid membrane by palpation and visually (this is difficult to do visually). Incise horizontally through to the lumen. The size of incision should be about 15mm. Remove scalpel and insert tip of little finger in the incision – ensuring it is in the lumen. 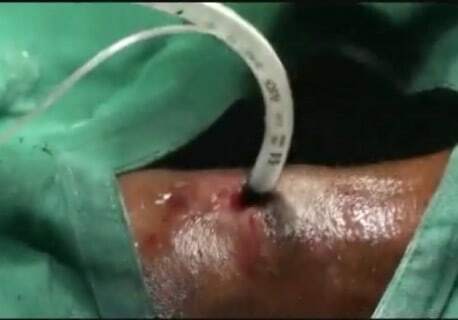 Of all cases only 15 were performed using the finger method. On 5 occasions the scalped handle or artery forceps were used and in the remainder a bougie was inserted. In 2 cases the initial incision was misplaced. In 2 cases vertical incisions were used as the cricothyroid membrane could not be palpated. 13 procedures were performed in the field and 11 were performed in hospital. This is a great case series that looks at this easy to perform, yet difficult to decide to do procedure. My approach, several years ago, was the horizontal incision through cricothyroid membrane, then the use of a pair or forceps, which then developed into putting a bougie through the incision, over which an endotracheal tube was railroaded. It is important to remove the blade, and certainly not to try and turn it and use the handle to dilate. This is an invitation to injury. During the Advanced Airway Workshops I show some videos of how close fingers come to the scalpels during surgical airway. In the last few years I have to come to like the VERTICAL INCISION. The main reason for this is, that if you are in the wrong place with a horizontal incision, you then need to make another cut. What if you’re still in the wrong place? Remember, this is not a procedure you do every day, and so there is a greater chance of error. In this case series, the two anaesthetists, exposed to a huge number of airway cases and whose business it is to know airway, only performed 24 cricothyrotomies between them over 19 years. That’s about 1 every 2 years for each of them. I believe a vertical cut(need only be 30mm),allows easier palpation and identification of the cricothyroid membrane. Palpation is with your index finger and you can usually perforate the membrane with your finger. This is now being taught in Airway Workshops in the USA. If you cannot perforate, then and only then use the scalpel to make a horizontal incision, or a stab in the membrane. The reason I recommend a small cut, is to try and avoid the cricothyroid arteries over the top-most aspect of the membrane. The membrane itself is about 8-10mm tall and about 15-20mm wide and there is more than enough room to place an index or little finger through and dilate the cut. The tube (I used size 6 cuffed) can then be placed directly into the hole. If there is any issue with feeding the endotracheal tube, a bougie can be used to facilitate placement. Remember, you are BELOW the cords and thus do not need to push the tube too far in; only so far as the cuff will disappear. Whatever method you use, and there is no great evidence, that one is better than the other, you need to PRACTICE, PRACTICE, PRACTICE. Performing a surgical airway is not difficult. The difficult part, is making the decision to perform it. BUT that’s easy too. Only when you cannot ventilate and oxygenate, when you have tried to intubate or tried a supraglottic device or tried to bag valve mask and still cannot ventilate and oxygenate, ONLY then do you perform a surgical airway. Good Luck. Let me know your thoughts on this, if you’ve performed one and the result. Comment below.